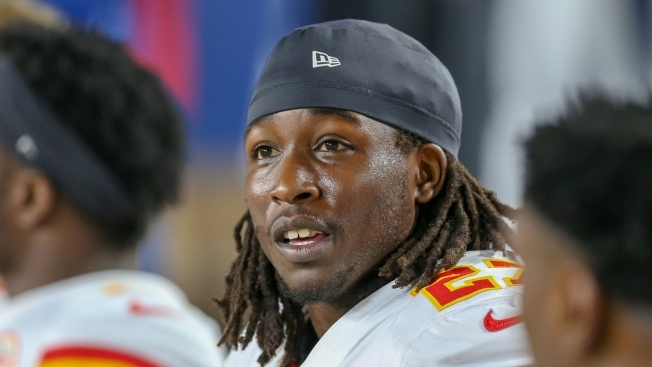 Chiefs chairman Clark Hunt said he was shocked by security camera footage showing Kareem Hunt shoving and kicking a woman in a Cleveland hotel, and that it was a collective decision by the organization to cut their star running back within hours. In his first comments since the incident nine days ago, the team's owner also said that the Chiefs were aware of two other offseason incidents involving Hunt, but not the extent of them. "We'd had some issues with Kareem not being truthful with what happened that night (in Cleveland) and we really felt in everybody's interest we head in another direction," Clark Hunt explained after Kansas City clinched a playoff berth with a 27-24 overtime victory over the Baltimore Ravens on Sunday. The other two incidents occurred in January at a downtown Kansas City nightclub and in June at an Ohio resort. No criminal charges were filed in any of the cases, and Clark Hunt said all of them were referred to the NFL for investigation. The league did not hand down any punishment until TMZ Sports posted the security footage from the Cleveland hotel, at which point Hunt was put on the NFL's exempt list. The Chiefs then announced within minutes they were releasing the NFL's reigning rushing champion. "I don't think we were necessarily trying to make a statement," Clark Hunt said. "We just felt like the best thing for the Kansas City Chiefs moving forward was to part ways with Kareem." Clark Hunt said he was comfortable in the background work done on Kareem Hunt by the Chiefs' scouting staff under then-general manager John Dorsey, even though he'd had disciplinary issues at Toledo. "When anybody comes to the Chiefs organization, part of what we expect of them is they're going to be good citizens," Clark Hunt said. "We want them to give back, but really the first step for a young player is learning how to conduct themselves not only on the field but off the field." The Chiefs have taken chances on other players with character concerns and for the most part they have worked out. Tight end Travis Kelce had off-the-field issues at Cincinnati but has blossomed into one of the NFL's top tight ends, while wide receiver Tyreek Hill — who was kicked out of school at Oklahoma State for an assault on his then-girlfriend — has become a model citizen and one of the Chiefs' biggest stars. The NFL has come under intense scrutiny for its handling of the Kareem Hunt case, especially after pouring resources into establishing a department to handle such investigations. Cleveland police also have launched an internal probe into their "overall response" to the incident. "I'm not sure I'm at a point where I can say there was a breakdown (in the NFL's investigation) and specifically what that breakdown was," Clark Hunt said. "The league has spent a lot of time and resources trying to build a department that can handle these types of situations. Obviously it's imperfect. I'm not sure you can ever reach perfection. There are limitations on the types of material the league security people can get, and I'm not sure we can change that." Hunt was among the NFL's leading rushers again this season when he was released, and the decision was a significant blow to a team with Super Bowl aspirations. It was compounded on Sunday when Spencer Ware, elevated to the starting role, left briefly with a shoulder injury and later with a hamstring problem. "There was a report today that he's going to do that," Clark Hunt said. "I hope someday he can return to the National Football League. I'm not sure when that will be. But our message to him was, even though we are parting ways, we're supportive of you. If you need help, we are here to help you."